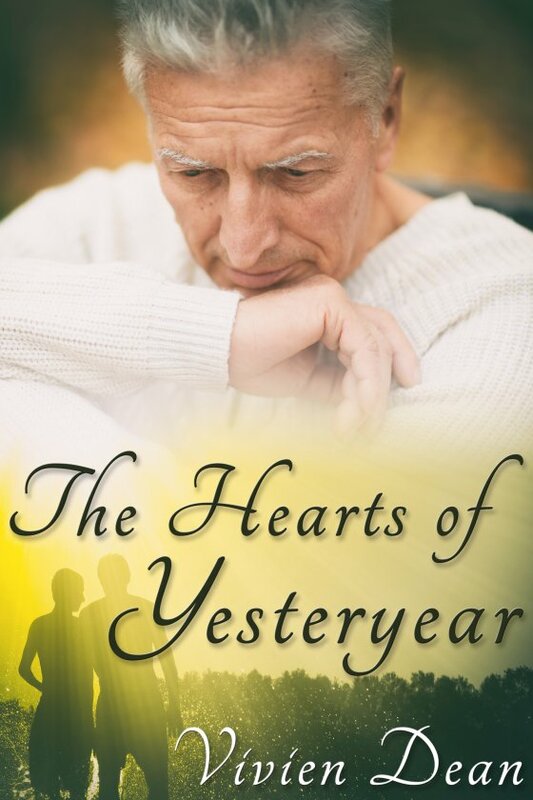 The Hearts of Yesteryear by Vivien Dean is now available! Throughout his career, actor John Paravati has stuck with what he told the gossip rags — he’s been in like, in lust, even in respect once or twice, but never love. All he’s ever cared about is performing. If he’s stuck now doing commercials for cruise lines, at least it’s better than shilling adult diapers. But Hollywood pretends, and John is a master. Because once upon a time, he loved two things more than anything — his best friend Frank and the movie palace he used as sanctuary. Over fifty years ago, John ran away from his hometown. Now, someone has restored the theater he left behind, and they want John at its relaunch. The memories still sting, but he agrees to attend, even though it means dealing with heartache. At seventy-seven, he’s too old to hold onto the hurt. The question is, however, is he too old to start over once it’s gone? Frank was already hard at work pulling the worn tent from the shed. In spite of being one of the better-off families in town, the Hansons had owned the same tent for as long as he’d known Frank. What had seemed like an opulent cave when he was six now felt cramped and cozy. Unless he slept diagonally, Frank’s feet poked out through the door now. They pitched it in record time, and John crawled in after Frank to hide from the outside world. He had to pull his knees up to avoid getting too close to Frank, but as soon as he did, Frank slapped at his arm. “That’s exactly what I’m telling you.” It had the added bonus of being true. “You think?” The possibility left John more than a little nauseous. He’d never thought of Dorothy in that way, even though he knew he was supposed to. She was one of the prettiest girls in school. At one time or another, most of the boys he knew mooned after her in hopes of a little attention. The only person John had ever felt remotely that way about was Frank, but he was smart enough not to let anyone cotton on to that. For the rest of the world, the answer was yes. For John, the prospect of kissing anyone but Frank — an impossibility no matter how he looked at it — the answer could only be no. John’s head jerked up, his jealousy sizzling through him like a shot of adrenaline. “Who’d you ever kiss?” he demanded. Out of the blue, Frank stretched and pecked John on the cheek, a touch so glancing he was back where he’d started by the time John realized what he’d done. Except it wasn’t, not to John, anyway. But what hurt more than the embarrassment of being considered too afraid to offer such a chaste kiss to a girl was hearing Frank dismiss the slight caress as nothing. In a pique of sudden anger, he scrubbed hard at his face, though his imagination kept playing it over and over again in his head. Its fleeting burn lingered even when he scooched beyond Frank’s reach and any more unsolicited kisses. “I’ll kiss Dorothy when I’m good and ready,” he retorted.